They are the (red) headline act. Some of the most striking redheads in the Highlands who are “proud to be ginger” are playing their part in a North photography festival. Inverness man Colin Cummings was at Eden Court yesterday to see his portrait ahead of the event. FLOW Photography Festival will be launched tomorrow. 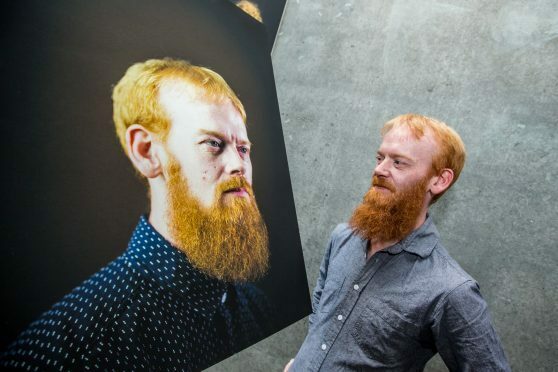 One of the exhibiting photographers Kieran Dodds sent out a call on social media for “Gingers of the Highlands”, which was answered by Mr Cummings. As a result, he had the opportunity to have his portrait taken at a photo shoot in Inverness by the acclaimed photographer whose research-driven photo stories and portraiture is known internationally. Mr Cummings said: “My girlfriend tagged me in a post on Facebook asking for people in the region with ginger hair to get in touch. I looked at Kieran’s photographs online, liked what I saw, then decided to go for it. I’ve always been proud to be ginger. “It was the first time I have ever done something like this so on the day of the photo shoot I didn’t know what to expect and was a little anxious. It turned out to be a fantastic experience. Kieran, who is also a ginger, really put me at ease. I would do again if I got the opportunity. “I hadn’t heard anything from Kieran since then, so I thought he wouldn’t use my picture. I was astonished when the festival organisers told me that my portrait is going to be on public display at Inverness Museum. Kieran took a lot of pictures of me in different poses. I’m very pleased with the one he has chosen. “My friends and family don’t even know that I answered Kieran’s call for gingers. It will be a real surprise when I take them along to see the exhibition. The portrait of Mr Cummings will be part of the exhibition “Gingers” by Kieran Dodds at Inverness Museum and Art Gallery from September 8-30. Flow Photography Festival opens on September 2, with a programme of exhibitions and events taking place across the Highlands and featuring work by over 40 photographers from, or working in, the north, from Scotland, Norway, Finland, Iceland and beyond.